Arup receiving the award with SOM and Architects 61. "Tanjong Pagar Centre showcases Arup’s commitment to delivering people-first solutions." In addition, Arup’s innovative design and engineering solutions for Bencoolen Station on Downtown Line (DTL3) were also shortlisted in the Best Design for Rail / Road Infrastructure – Project Partner award category. 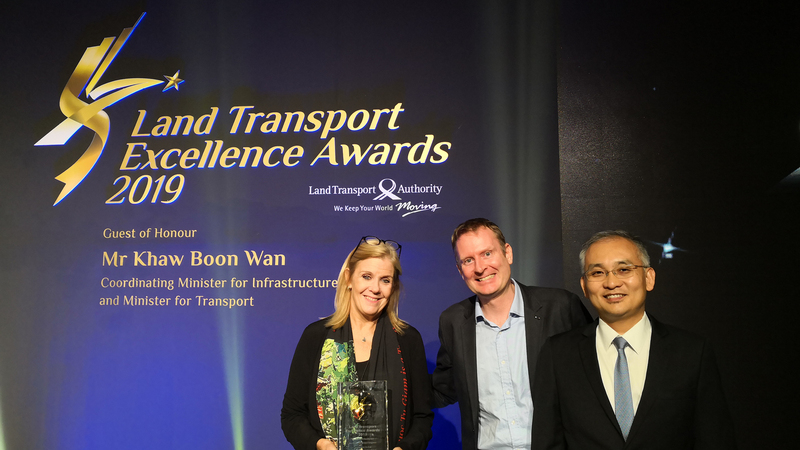 Hosted by Singapore’s Land Transport Authority (LTA) every two years, the Awards celebrate outstanding achievements by the city-state’s land transport industry, recognising industry partners and individuals who have demonstrated commitment and dedication in developing a people-centred land transport system. Tanjong Pagar Centre is Singapore’s tallest building at 290m. Arup engineered the 156,000m2 mixed-use development with commercial, residential, retail and hotel amenities, and direct connection to the Tanjong Pagar MRT Station. We provided civil, structural and façade engineering, and environmentally sustainable design – delivering solutions to realise the architectural complexity of the skyscraper within a dense CBD environment bounded by four roads, heritage shophouses and an operational MRT station. The architectural and structural excellence of this vertical city has since set new benchmarks for sustainable and liveable developments in Singapore. Arup was also shortlisted for Best Design Rail / Road Infrastructure – Project Partner for Bencoolen Station, the deepest MRT station in Singapore, and one of the most challenging sections of Downtown Line 3. At 43m deep, the station was constructed within an extremely dense network of historical buildings, existing commercial buildings and infrastructure and operational MRT lines including the Circle and North-East Lines. Pushing engineering boundaries, Arup worked closely with LTA on innovative and safe designs and solutions that improved construction productivity and buildability of the six-level basement, and overcame the temporary closure of the entire Bencoolen Street to facilitate construction. The final phase of the Downtown Line opened in 2017 and has greatly enhanced connectivity to Singapore’s CBD.